Ever thought about owning alpacas? 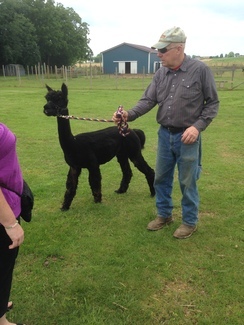 Presenter: David Wysong of Quarry Critters Alpaca Ranch. The fee you pay will be applied to the purchase of any alpaca. 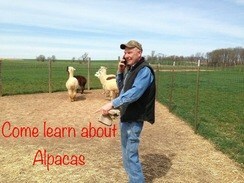 Here is information for people interested in owning alpacas. Learn how to set up farm lay out. Learn what fences are needed. In this class you will learn about water, grass and clean up. How much land does it take? How many alpacas should I start with? What do alpacas eat? Where do I get the food? Do I want to start a breeding program? How often are alpaca sheared? What can I do with the fleece after shearing? What is needed to keep my alpaca healthy? Oh my, so many questions. Please come ask us. ask a few of our own. Then go on tour of the buildings, pastures and meet the alpacas. David Wysong of Quarry Critters Alpaca Ranch. Reserve your space in class now!